Marine Grade Battery Cable is tinned copper strandings for maximum protection against corrosion, electrolysis and fatigue due to vibration and flexing. Rated at 600 volts and 105 degrees C, the heavy duty insulation is resistant to heat and abrasion. Exceeds all UL 1426, US Coast Guard Charter Boat and ABYC standards. Primarily used for Battery connections, Nominal O.D .515" "Sold per foot"
Heavy duty, Pure copper for maximum current flow and Tinned for corrosion resistance and easy soldering. Closed ends to seal out moisture. ""Select a size hole."" Made of PVC. Satisfies U.S. Coast Guard requirements. Will fit most marine batteries. Insulates and protects connections from mechanical abuse, wire pullout and abrasion. Heat activated adhesive lining provides impervious seal to salt water, oil, acids, and sunlight. Highest shrink ratio - shrinks to 1/3 original size. Kit Contains 6" L X 3/4" dia Red and Black shrink tubing. 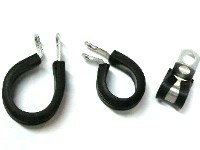 Manufactured with a PVC over-all jacket outside and general purpose primary wire inside. The single conductors are stranded copper, and each conductor is color-coded for identification purposes. Very tough cable with resistance to cracking, abrasion, oil, grease, acid, and weather. " Sold Per Foot "
Silver tinned copper stranded wire for maximum protection against corrosion, electrolysis and resits fatigue due to vibration and flexing. Rated @ 600 volts and 105degC The heavy duty insulation is resistant to heat and abrasion, Exceeds all UL and Coast Guard standards. Sold Per Foot. (((Select a Color)))Blk,Grn,Red,Wht,Yel. Features tinned copper for maximum current flow and corrosion resistance. Adhesive lined heat shrink tubing, shrinks to form a tight seal and is the ultimate in vibration and strain relief. "Sold in pack's of 25 pcs." Features tinned copper for maximum current flow and corrosion resistance. Adhesive lined heat shrink tubing, shrinks to form a tight seal and is the ultimate in vibration and strain relief. Sold in pack's of 25 pcs. Aluminum Adel clamps make mounting fuel lines and wires easy! Wiring your boat's engine can be simple and easy. Take the frustration out of bad connections. These weather proof correct fit Hardin Marine engine harness make them the perfect choice for a new boat or to update an old boat. Save time and money. Wiring your boat doesn't have to be a hassle due to tangled wires, bad connections, and guess work. Bad wiring can literally ruin a boat. These Hardin Marine boat harnesses use 275 degree, thermal crossed linked wire that won't kink and is abrasive resistant. 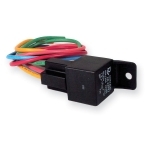 Don't take chances with your boat, trust the leader in marine wiring, Hardin Marine. 20 Ft. with Volt Meter. All Brass ignition starter switch. Three position "OFF/IGNITION/START". Returns automatically from start to ignition position. Furnished with chrome plated brass face nut, brass lock nut and stainless steel springs. Mounting bushing is 1-5/16" long, and 13/16" in diameter. Overall dimensions are 2-1/2" Long X 1-1/4" Dia. Accommodates 1" panel. Heavy Duty Chrome plated brass face nut, washer and back-up nut Chrome plated plastic knob Stainless steel Springs Mounting stem: 1-1/4"L (3.18cm) x 3/8" dia (.95cm) Position: Off - On Circuits: 1 Rated: 25A @ 6V DC - 15A @12V DC Fits panel thru: 1"
Normally "Off" S.P.S.T. Non-corrosive construction, Plasticized body sealed against moisture and dirt, Two 18 gauge insulated copper wire leads, 12"L , Chrome plated brass knob and face nut, Mounting stem: 1-1/4"L (3.18cm) x 3/8" dia , Position: Off - On , Rated: 6V-36V DC , Fits panel thru: 5/8". Waterproof and Dustproof with protective neoprene cap. Rated @ 35 amps at 12volts. 5 Pin relay. Universal applications, electric fuel pumps, etc. ATO/ATC 6 Circuit Fuse Block With Cover. Clear cover with a gasket protects your circuits from dust and water spray. Electrical connections are made using 1/4" female push-on terminals. Maximum load per fuse is 30 amps. Max load capacity for all circuits combined is 65 amps. Double ball kill switch. Can be made to either make or break circuit. Snap-off cap releases in full 360’ circle. Recognized by all major boat racing associations. One cap is included with the switch. However it is a good idea to carry a spare cap in the boat at all times in the event the cap is damaged or lost.